Amy Kalmin was sure her bridesmaids would wear their purple skirts after her wedding, but then reality set in. As a bride, Amy Kalmin thought she was pretty savvy. 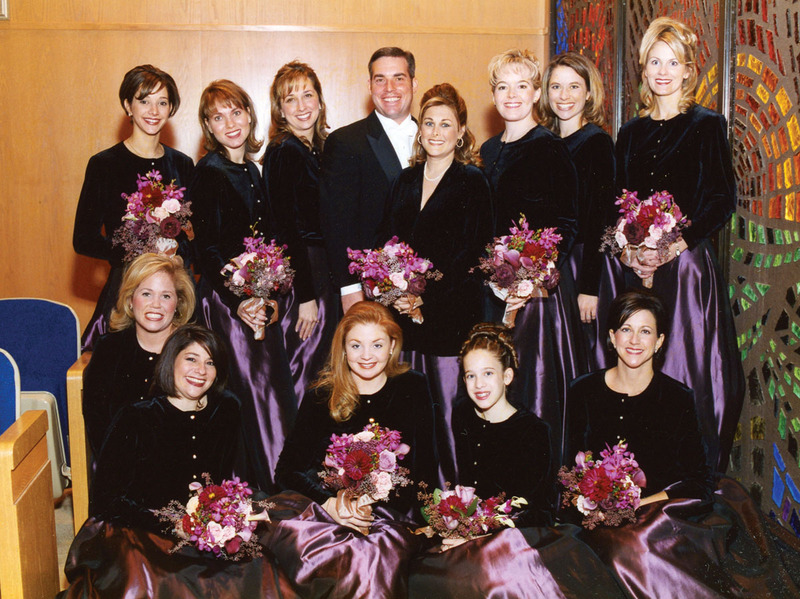 Fourteen years ago, Amy, who’s in business development, married her commodities-broker husband Murray surrounded by 10 or 12 bridesmaids (14 years and three kids later, who remembers?). For their dresses, she chose long purple skirts and asked all the bridesmaids to add their own black velvet top. The idea was that the friends would undoubtedly wear their own tops again, and the skirts, Amy thought, would be perfect for subsequent parties. “I was convinced my skirt was the most brilliant thing,” Amy says. “They’d wear these long, beautiful, iridescent, eggplant skirts again with a white Gap shirt, á la Sharon Stone. It was going to be the new thing.” But it didn’t quite work out. Amy Kalmin was sure her bridesmaids would wear their purple skirts after her wedding, but then reality set in. Amy Kalmin was sure her bridesmaids would wear their purple skirts after her wedding, but then reality set in. Just about every bride who’s ever had bridesmaids thinks the same thing: Theirs is going to be the dress that everyone loves wearing again and again. I was guilty of it. Looking back, I still hold that my dresses (all 12 of them) were classic and pretty and intrinsically wearable, but ultimately they were what they were: bridesmaids’ dresses. What is it with brides? What are those rosy glasses (or is temporary narcissism a better descriptor?) that tell us our dress is the best one ever, the one that people will wear again and again? So what to do with the bridesmaids dresses? Having a closet full of gowns that cost several hundred dollars each – that you’ll never don again – isn’t too practical. I saved mine for my girls to play dress-up in, which has been kind of fun, because with each wearing, even as the dresses got dragged outside into the yard, I’d remember different friends’ weddings. Or, take a cue from Amy. Though her iridescent, eggplant skirts never saw another all-night party, it turned out she was a pretty savvy bride. Even before she was a bride. Prior to getting engaged herself, Amy and her friend Ceron, the hairstylist, hosted a wedding shower for a friend, instructing everyone to wear a favorite bridesmaid’s dress. “The party was at the height of the time you were in wedding after wedding, spending a fortune, just out of college, with closets full of dresses,” Amy says. “My friend and I were talking about how funny it was that we had all these gowns, when we’d really rather have spent the money on something we’d wear again. So we thought we’d give everyone a chance to wear the dresses again.